A few months ago I had a conversation with a fellow professional that had helped me with my 401k and when my statement came at the end of the year, I realized that there was an additional 1% in fees and asked him about it. His response, “Don’t worry, it’s just 1% in fees, it’s not a big deal.” However, this level of short term thinking is what leads to long term problems. Did you know that the 401k was started not to be a standalone retirement vehicle, but a supplement for a pension? The nature of work environments used to be very different: You work for a company for 30 years, you get a pension, you retire and live off this pension. Nowadays, pensions are becoming more and more of a relic, which has caused many to resort to other forms of investment, making the 401k very relevant to our generation. So let’s take an example. Three friends: David, Tyler and Joe all invest $100,000 for 30 years and for the sake of argument, all of them receive an 8% annual growth. 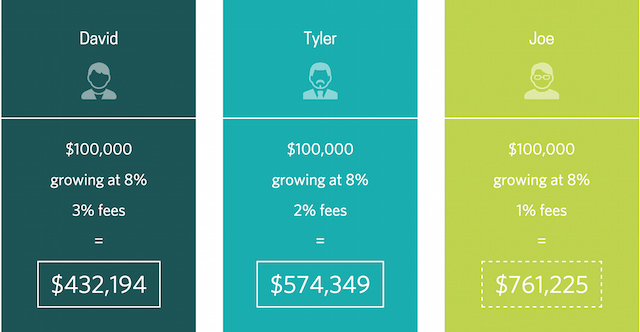 The only difference, David pays 3% in fees, Tyler pays 2% and Joe pays 1%. How big of a difference will this 1% make? If you guessed significant, you would be correct. As you can see, by the end of the 30 years, Joe has nearly double what David has. And Tyler has almost $150k more and the difference was “just 1% in fees.” Now you might say that’s plenty of money to live on, but, is it? If all 3 of them need $60,000 annually to survive, David would run out of money before his 10 year retirement anniversary. Tyler would be able to sustain approximately 15 years and Joe, well Joe will be able to survive off the money until he is 95. All those additional years because of just 1% in fees. With the increase of life expectancy, do you want to be David, or do you want to be Joe? Take some time to take a closer look at your retirement funds and truly understand the fees/hidden fees that your fund charges. Nobody wants to go back to work when they’re 75. Or worse yet, sustain off the standard of living that the government can offer you.